Another year has passed, as have many pivotal milestones for Realogics Sotheby’s International Realty (RSIR), our brand and the local housing market that we serve. After meteoric home price growth in the region throughout 2016 and 2017, the market began to shift in 2018. Though things are changing in the Puget Sound region, the strong fundamentals underpinning economic growth have not. Our acclaimed Research Editor and Data Analyst, William Hillis has assembled a year-over-year performance review of eight key counties and 31 regional markets, with a 2018 retrospective, analysis of the S&P Case-Shiller Home Price Index, and a 2019 outlook. Below I have outlined some key insights from the report. This area comprises a diverse patchwork of both affluent and middle-income neighborhoods northeast of downtown. Some, including Madison Park, Denny Blaine, and Leschi, offer frontage on Lake Washington; but Capitol Hill and Madison Valley are also included. Quarterly numbers of residential homes sold in Central Seattle were lower year-over-year in all but the second quarter of 2018. There were nearly 23 percent fewer sold in the fourth quarter and 11.6 percent fewer over the entire year. In both the first and second halves of 2018, fewer condominiums were sold in Central Seattle than in the equivalent periods since the first half of 2014. Condominiums comprised 41.1 percent of 2018 home sales in Central Seattle and 69.2 percent of home sales in Capitol Hill. Central Seattle was one of several areas that saw an end to 15 consecutive quarters of median residential market times shorter than two weeks. Cumulative days on market in the area nearly tripled from the third to the fourth quarter of 2018, from nine days to 26. There were 31 residential homes sold in Madison Park for an average of $1.83 million, 24 in Washington Park for an average of $2.17 mil-lion, and seven in Broadmoor for an average of $3.52 million. 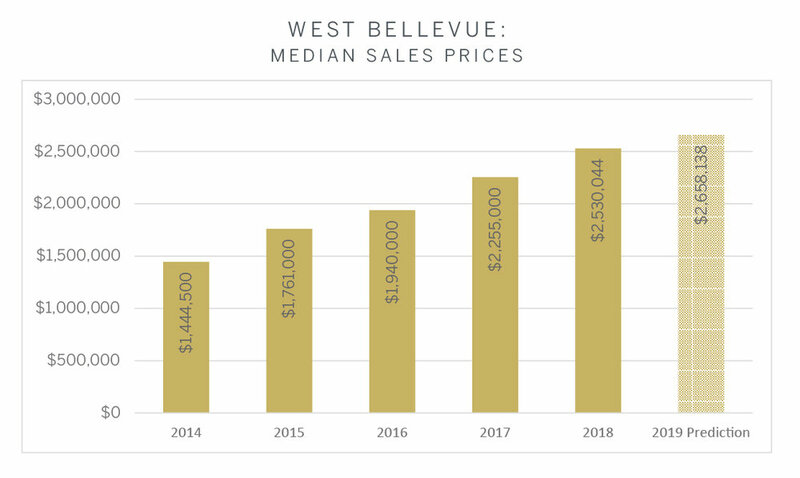 The median residential price in Central Seattle progressed at a compound annual growth rate of 8.9 percent from 2014 through 2018. This is one of the areas in which Realogics Sotheby's International Realty is forecasting a still higher median price in 2019: to $990,000 from $950,000 in 2018. This area comprises several distinctive communities west of Bellevue with annual sales in the single digits or fewer. Among these, six residential homes sold in Beaux Arts for an average of $2.57 million, 69 in Clyde Hill for an average of $3.17 million, 33 in Medina for an average of $4.46 million, 23 at Yarrow Point for an average of $4.53 million, and seven at Hunts Point for an average of $6.2 million. For additional market information, please review the full Market Report below. Would you like to know the implication for homes in your neighborhood? Contact me today for a complimentary analysis.